Lobster Cove Lighthouse sits upon a cliff in Rocky Harbour in the famous park known as Gros Morne National Park in Newfoundland, Canada. Since 1892, the Lobster Cove Lighthouse has stood in Rocky Harbour in Gros Morne National Park in Newfoundland Labrador, Canada. Lighthouse keepers no longer reside at the Lobster Cove lighthouse as it has been fully automated since 1970. Visitors can tour throughout the building as it is still opened and is home to an interpretative exhibit. Lobster Cove Lighthouse in Lobster Cove, Gros Morne National Park, UNESCO World Heritage Site, Viking Trail, Trails to the Vikings, Highway 430, Northern Peninsula, Great Northern Peninsula, Newfoundland Labrador, Newfoundland, Canada. 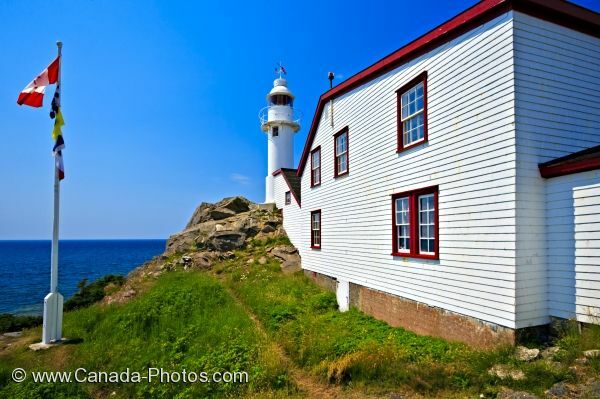 Picture of the historic Lobster Cove Lighthouse in Gros Morne National Park in Newfoundland Labrador, Canada.